In the first years of life kids are growing and learning fast. Pediatric physical therapists tend to work on physical development activities that focus on large motor skills. Large motor skills are activities like walking, jumping, running, or skipping. Pediatric physical therapists know that when working with children, making these activities fun and exciting gets kids more excited to participate. These 10 activities are all fun and centered around developing and growing strength, coordination and balance in kids. Obstacle Courses – Obstacle courses don’t have to be complex. Using items from around the house like couch cushions or chairs to zig zag around make the perfect obstacle courses. Scavenger Hunts – Kids love these! They can be modified to add different developmental activities as part of the hunt. For example, have a child skip to the next item on their list. Then have them walk backward to the next. Work on the different skills you are trying to practice. Get FREE scavenger hunts in the freebie library from Pink Oatmeal. Kids Yoga – Kids yoga is so much fun and anyone can do it. Kids love when yoga is about something they can relate to. Using themes, seasons, or holidays can make yoga even more fun. Check out all of the different kids yoga themes, resources, and ideas. Outdoor Free Play – Kids need opportunities to get outside and play. We live in a technology based society that doesn’t have as much focus on outdoor play. Outdoor play benefits both large motor and fine motor physical development and is a must for kids of all ages. Balance Activities – Balance activities can be a part of yoga, obstacle courses, outdoor free play and scavenger hunts. They can also be fun games set up specifically to challenge balance. Check out all of the balance exercises for kids ideas to get started on some fun and unique ways to challenge balance. There are some great videos showing you exactly how to do the balance activities. Core Strengthening Activities – Strong cores are important part of physical development for kids. Weak cores can result in poor gross motor and fine motor skills. Check out all of the pediatric core strengthening exercise ideas to get started on fun and engaging core strengthening activities. See even more ideas for kids gross motor activities and check out all of our motor planning ideas from Pink Oatmeal. 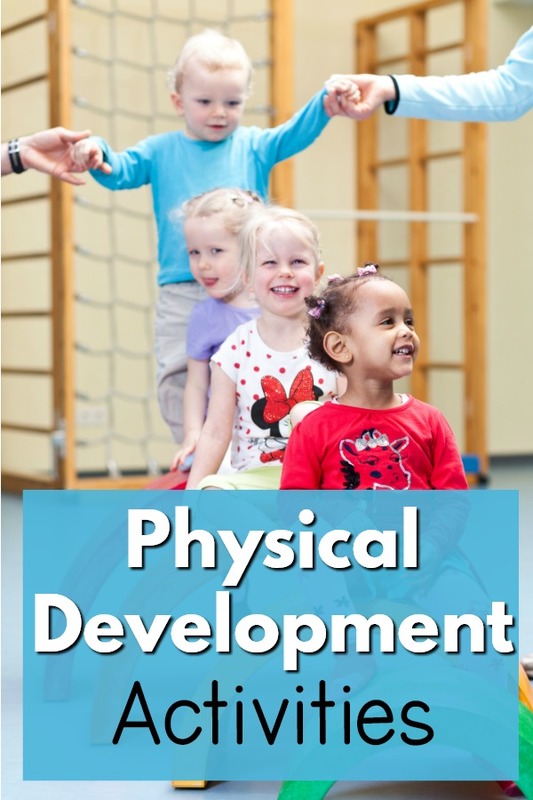 Looking for physical development activities that you can use right now? Pink Oatmeal has an entire freebie library and shop full of activities and printables that promote fine motor skills, gross motor skills and physical activity. CHECK IT OUT NOW!